It has been two months since my last update about my summer... My, how time flies! I don't have the time (or space) to write about everything that has occurred (and is occurring), but here is a short synopsis. Cincy: Once again, the monastery in Cincinnati proved to be a relaxing and much needed time to meet with my spiritual director and reflect on where I am at. Moving on from college has been difficult and I have needed time to process that change. 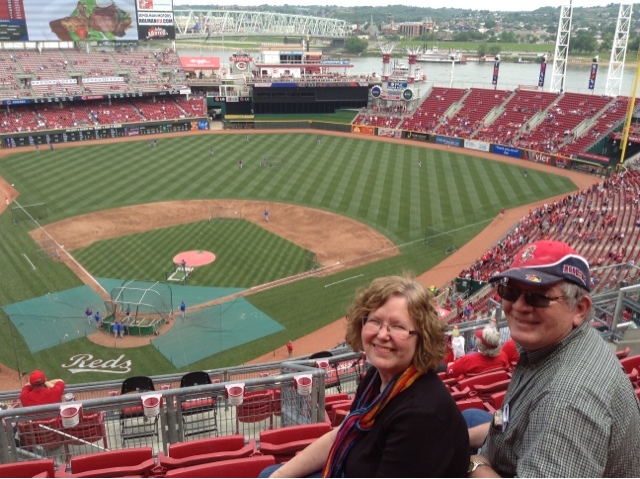 The reds also won the game my parents and I went to! Yay! Michigan: My friend Jana and I had such a great time camping in Michigan. With the exception of a storm the first night and a miserable trip to the laundromat to dry all our blankets, we had great weather, good food, and just a really nice time talking and spending serious quality time together. I love her so much and am glad we could make this trip a reality. GRE's: The test went ok, some sections better than others. At this point I am not planning on retaking them...I think the scores will get me into the schools I want. But the best thing was after my test (in Toledo), I went and picked up Krissy! 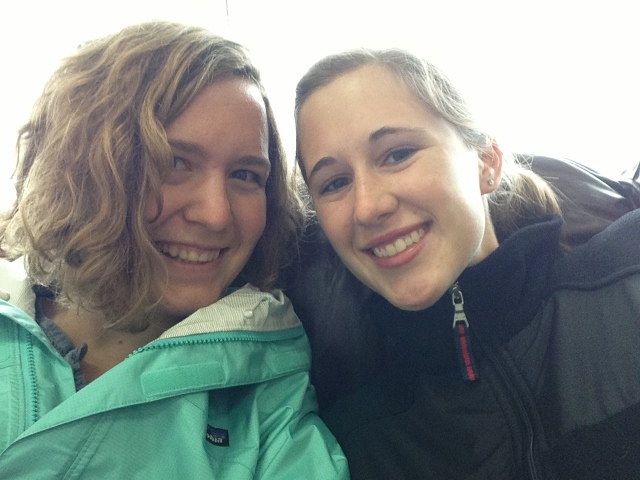 She had been staying in Michigan and was heading to Texas, but she was able to come for three wonderful days! 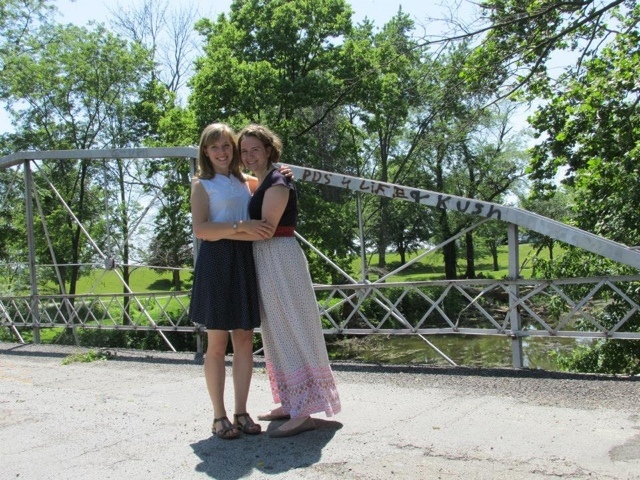 It was so wonderful to have her around and also to remind me of the beauty of Ohio. We went on a 20 mile bike ride the one day, and it was truly beautiful as we rode past fields and streams. It is not Colorado, but when you stop and truly look, there is much to behold. 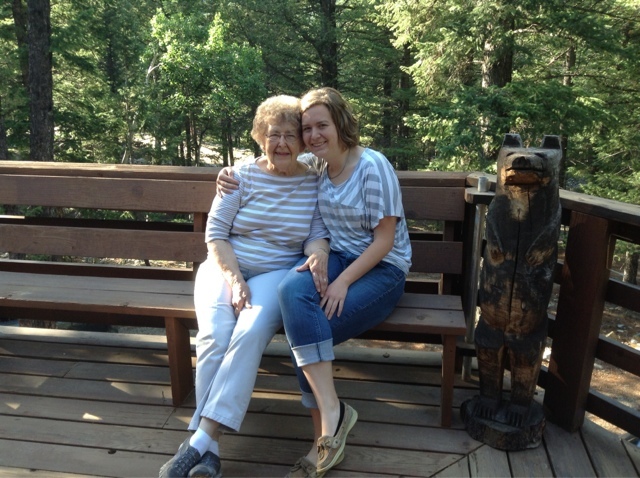 Colorado (week one): After a long drive from Ohio to Kansas, then Kansas to Colorado, my family made it to our cabin. We had a full house with my parents, grandma, two brothers, sister-in-law, and my childhood friend Amy. We hiked, fed the chipmunks, explored the town of Salida, and helped with some fire mitigation outside. I then drove my oldest brother back to the Denver airport, spent the night with my mom's cousin, then flew to Phoenix. Being a delegate was a good experience learning about church business and seeing convention from a different viewpoint. (This was my ninth convention, but first time being a delegate). I also really enjoyed seeing different people I know from different parts of my life. I got to have one last one-on-one with Judy, as well as spend time with my cousin Beth and her two kids, Simon and Nadia. Colorado (week two): This has been by far the best week of the summer! Ruth and I flew back to Denver, got my car, and met two other friends (James and Jenna) at the Denver art museum. It was so fun to all meet up in a new place. We ate dinner and explored the city a bit before meeting p with the fifth member of our group (Josh) and drove over the mountains to the cabin. Our first full day we made breakfast before heading to Buena Vista's farmer's market. We then drove to the top of cottonwood Pass and hiked a little ways up. We then got groceries before going back to the cabin to make dinner, take another short hike, then watch Mulan. Our second day we went white water rafting in the morning, then fed chipmunks/explore the ghost town of St. Elmo, hike Agnes Vaille (a local hike to a waterfalls) before making a late dinner (veggie burgers and sweet potato fries!) then stargazing. The third day we travelled to Aspen, took a bus to Maroon Bells with a hike to Crater Lake, then walked a little bit around in town. We watched Bride and Prejudice while eating dinner and heading to bed early. The fourth day consisted of leaving the cabin at 4:30 to drive 1.5 hours to the trailhead of Mount Quandary. 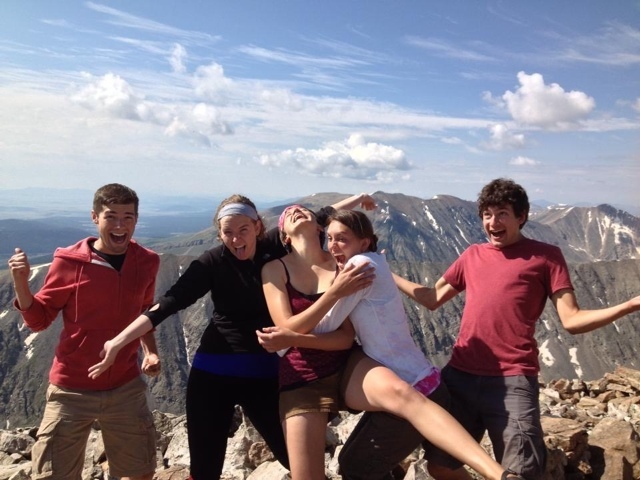 It took 3.5 hours, but we made it to the top of our first fourteener! For those not familiar with Colorado, fourteeners are mountains with an elevation of over 14,000 feet (of which there are 54 in Colorado). I have always wanted to climb one, but no one in my family has ever wanted Togo with me. It was a fairly intense climb, but we loved it! There were lots of mountain goats and other friendly climbers. That night we just napped and relaxed. The fifth day we drive to Colorado Springs where we visited Garden of the Gods, ate at Which Wich (my new favorite restaurant), toured the Olympic Training Center, and dropped Jenna and Josh at the airport. The next day after cleaning the cabin, Jmes, Ruth, and I began our long journey home. The first stop was in Topeka, Kansas, then had dinner the next day at Ruth's house in Indianapolis before sleeping at my house, then traveling to Harrisonburg (where James is from). I spent two days there visiting some friends. New Windsor, Maryland: I am currently at orientation for Brethren Volunteer Service. Things are going really well so far, but that is for another post.